As a techno-savvy society, we’ve become accustomed to engaging with the transcendental dimensions produced by VR, MR and 3D cinema. 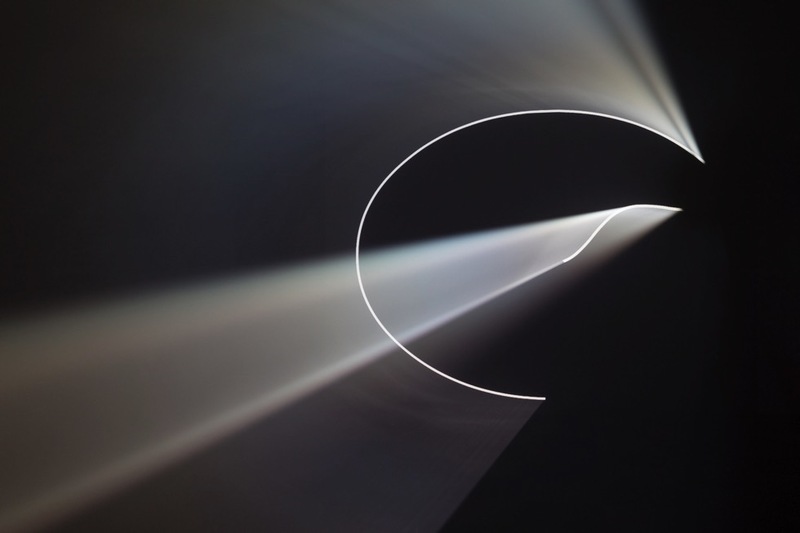 Anthony McCall, a master projectionist, moves beyond cinema by moulding its fundamental component – light – into a volumetric form. Solid Light Works, currently at The Hepworth Wakefield, celebrates the British-born, Manhattan-based artist’s practice from a sculptural perspective. Running until 3 June, this bold exhibition transforms Hepworth’s galleries into three immersive light installations with an accompanying archive of works on paper. Collectively, the show instills upon its audience the interdisciplinary nature of McCall’s oeuvre as well as its alignment with technologies from the 1970s to the present day. Existing between cinema, the moving image, sculpture and drawing, McCall’s practice is difficult to define. His first “solid light” piece, Line Describing a Cone (1973), incorporates celluloid film, smoke and a joyfully rumbling projector to engineer a progressive curved line, which over the course of 30-minutes, loops from a single dot into a full circle. A specified distance and smoke expose the air particles between the projector and the screen, ultimately revealing a sculptural cone. 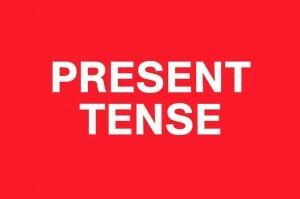 Though not permanently on view, Line Describing a Cone’s staging at the preview and at the upcoming Expanded Cinema day (this Saturday 19 May) is enabling contemporary audiences to observe this retrospective installation in action. The piece’s (though somewhat side-lined) inclusion grounds viewers in McCall’s process; but it is not the focus of Hepworth’s presentation. Instead, digitally-animated projections, a medium adopted by McCall following a two-decade hiatus, is the show’s highlight. During a recent Q&A with Chief Curator Andrew Bonacina, he explained that “we wanted to provide a stronger sense of McCall’s current thinking. 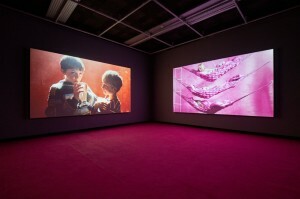 Unlike the earliest pieces, the works using digital technology are always conceived as infinitely-looped gallery installations.” This “infinite” process, made possible through technological advancement, ushers the spectator to linger for a limitless time – unlike McCall’s 16mm works which, due to the nature of celluloid, have a natural start and end point. 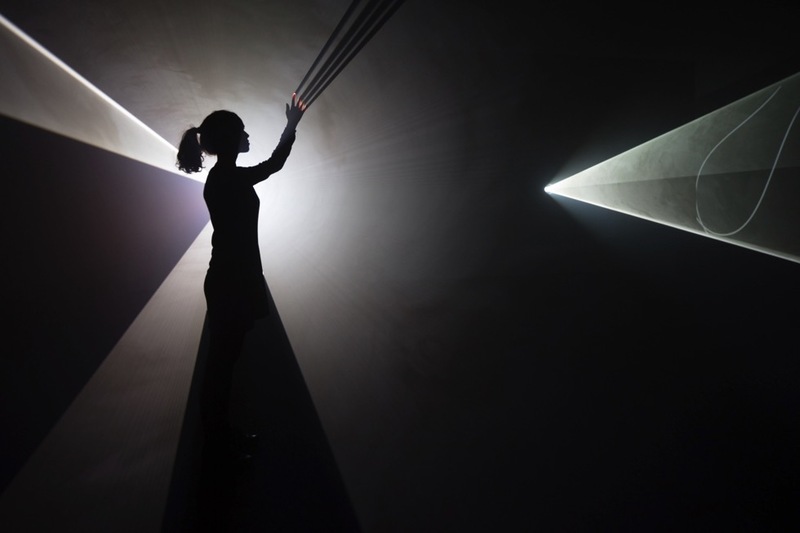 Technology has also led to more elaborate forms: the central pillars of Solid Light Works – titled Doubling Back (2003), Leaving (With Two-Minute Silence) (2009), and Face to Face (2013) – all combine multiple line animations within one or two conical projections. Wandering between geometrical shards of light, we apprehend McCall’s intentions to maneuver his audience. Doubling Back produces constantly changing pockets of volumetric light through the projection of two wave drawings, and Leaving displays the formation of two cones of light, each accompanied by their own, subtle soundtrack. At first, we are apprehensive, mindful not to intrude upon the poetic scene unravelling before us; soon, we embrace our own burgeoning silhouette and the augmented sensations embedded in traversing a seemingly impenetrable body of light. Made ever-more illusive by the billowing dry ice, the works feel near-supernatural; their rotating and unravelling forms toy with the audience’s depth perception and upset our natural, vertical balance. We feel either invincible or elatedly nauseous; sensations which are reinforced by echoes of urban sounds heard inside Leaving’s conical forms. Conceived with the same principles as Line Describing a Cone, these digital installations illustrate the technological decade that they were produced in: the former noise of a 16mm projector and swirls of cigarette smoke are replaced by a silent projector and invisible smoke machines. The audience is left, standing in a dark room, unable to immediately distinguish the source of these enigmatic volumes: this is modern-day trickery, apt for an audience geared towards three and four dimensional cinema. Gone are the dusty lofts which played host to McCall’s early experimentations: enter, instead, the formal gallery, post-smoking-ban air and the late ‘90s invention of the smoke machine. What remains, however, is the simplicity of McCall’s work: while digital projectors and drawing software facilitate more complex sequences, the artist remains loyal to the “essential” component of cinema – light. In Face to Face, McCall further dispels the barrier between screen and spectator by projecting onto translucent surfaces. We’re invited to walk around the space, to look behind the work and to connect with both the transient conical form and the unravelling line drawing; an aesthetic that reflects upon the artist’s heritage in both sculpture and drawing. In staging the work at Hepworth – a gallery which focuses on the third-dimension – new perceptions of the artist’s practice can be garnered. 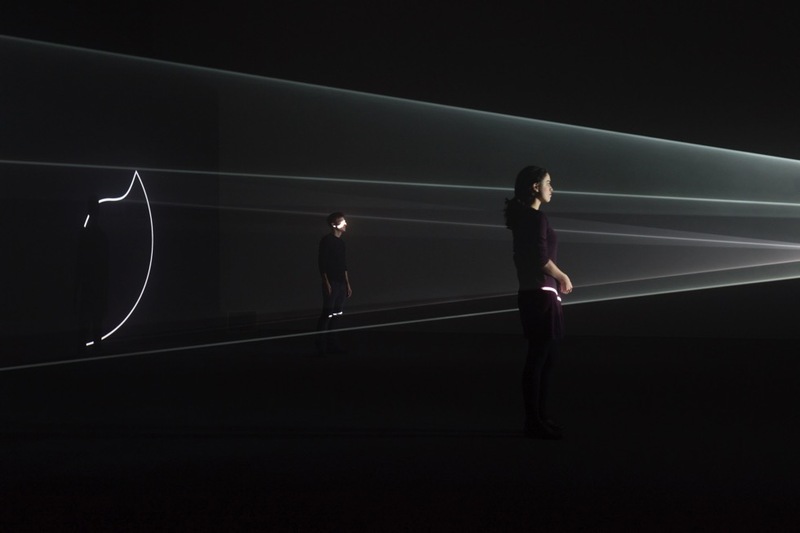 Though grounded within the moving image, McCall’s focus on using linear light to engineer volumetric forms in a designated space, beyond the screen, connects more fervently with sculpture than cinema. McCall chooses light and line, instead of plaster, metal or clay, as his sculptural medium. Much like a traditional sculptor or draftsman, McCall meticulously plans his installations prior to their realisation. Displayed within a central archival “hub” is a selection of drawings and artefacts which bind the exhibition together. Line drawings and sequence studies tell the story of each installation’s mathematically calculated journey – Partial Cone (1974) is represented by inked scores on graph paper, and Line Describing a Cone by a sequence of line- and cone-drawings. Newer works are depicted in digitally-rendered images of plotted pathways or as the artist calls them, “footprints.” When printed, these contemporary “drawings” are a tangible counter-part to the more ephemeral, digital projection; a lasting legacy of the work. McCall reminds us of the beauty and potency of the drawn line in Five Minute Drawing (1974). Presented at the exhibition’s entrance, the work comprises a curved line and a straight line, straddling the width of six pages of blank paper. Rudimentary in its appearance, Five Minute Drawing’s precision – detailed in a video of McCall performing the work in 2008 – reflects the artist’s intention of realising a pre-conceived “score.” He produces a straight, diagonal line via the calculated twanging of a piece of string. This mark-making instantly adds dynamism to a two-dimensional surface – a simplistic technique that echoes throughout McCall’s all-encompassing light projections. Essentially, it all comes down to drawing. Though bound to the gallery, Solid Light Works sheds light on McCall’s ambition to work on larger scales. Crossing the Elbe (2015) renders visible the artist’s year-long public commission in which he projected three, five-kilometre searchlights across Hamburg. Over three months, the beams touched every part of the city through the weekly alteration of each searchlight. Harkening back to his Happenings-inspired Landscape for Fire II (1972), in which McCall created a 36-point grid of fires in North London, Crossing the Elbe illustrates the artist’s interest in devising site-specific interventions in “real-time” scenarios. That being said, Solid Light Works’ removal from the external world assists McCall’s reductive aesthetics in bringing about a certain neutrality. It is refreshing to observe that the viewer is encouraged to rediscover elemental materials. Indeed, an interplay of light, darkness and depth-illusion make for a remarkably rewarding experience. Everyday, we’re bombarded by images of aspirational locations and commodities: in the Gallery, McCall’s work provides a meditative closure from the outside world. 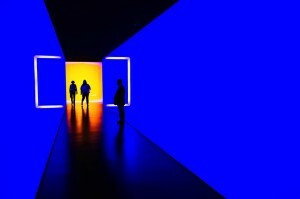 It’s an encounter that enables audiences to attune themselves to disruptions in perception and balance; whether you plunge into the mathematics or merely meander between shimmering shards of light and line, is up to you.